This machine looks and feels very solid indeed, although it wasn't difficult to manoeuvre it into position in the workshop. It comes with adjustable screw-in rubber feet to settle it firmly and lifting loops if you need to fit them for craning although it isn't heavy enough really to warrant that. Initial impressions are of a good build standard, the casing is neat and tidy and the tables are finely ground cast iron. The thicknesser bed hasn't been skimped on - this too is cast iron on a single big column with a smaller steadying column, all very rigid and rock solid. 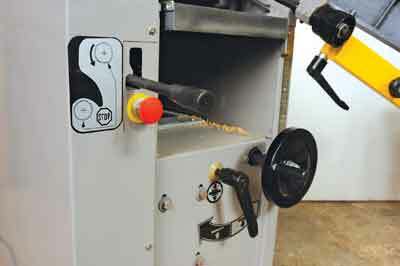 Although it looks pretty much like any other standard imported iteration of a planer thicknesser, it has several important points of note. The rigid, smooth action thicknesser bed is one. The surfacing tables are very flat ground with sound reduction slots. The fence extrusion is easy to slide across the cutterblock, is substantial in size and can be set correctly at 90° or any angle in between. The bridge guard looks to be standard but unlike many others, it can be raised to any height and a knob can be used to make the guard sit level. It might not seem terribly exciting to be able to raise it quickly to any height without any restriction, but I think readers should be aware that the Health & Safety Executive are quite definite about the correct way to plane overhand. 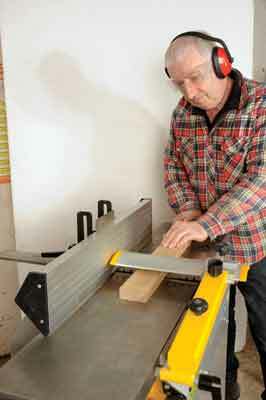 Their recommendation is that timber should always be under the guard, rather than beside the guard against the fence, unless the section being machined is wide and narrow in thickness. Otherwise the cutterblock is exposed for part of its length and accident history shows this to be a definite causal factor. 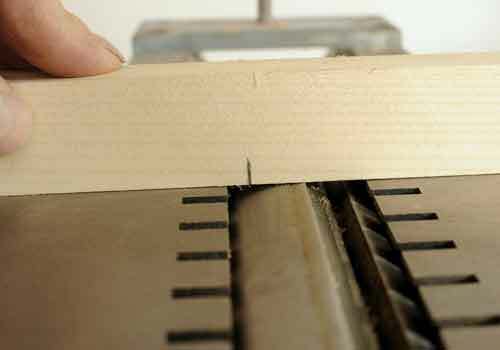 Many woodworkers do this operation using the wrong method according to the HSE, so the Warco definitely scores here where some planers cannot have their guard raised high enough for some workpieces! The three knife block uses the normal spring supports to bring the blades up to height and five bolts to fix each one in position. 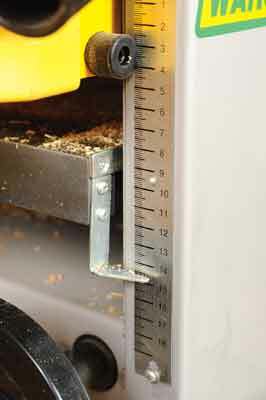 No height setting aides are provided and from experience, I would recommend investing in a good setting jig so you can quickly set the three knives otherwise a lot of time is wasted trying to get this right. The height pointer for thicknessing is actually accurately set although the scale can be adjusted if necessary. 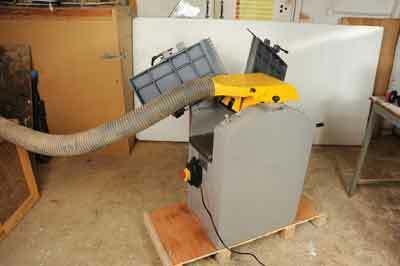 This machine has a 1,500W motor, which doesn't sound a lot but it seems to cope very well. There is the standard rubber booted on and off buttons at the overhand feed end and a resettable emergency off button at the thicknessing feed end, plus the drive engagement lever with a slightly confusing diagram, which I would suggest is best ignored. This is a solid, no frills competent machine. The base seems large for the relatively small tables, longer is better for straightening, but I have no complaints about the flatness or finish on the wood. Investigation showed a slight step or 'snipe' at the outfeed end of the workpiece caused by the cutters being set a fraction too high, but this was easy to correct. The fence extrusion isn't completely flat across its height, which is a disappointment, but it didn't seem to materially affect the squareness of the planed timber. Changeover to thicknessing entails removing the fence completely, which is a slight inconvenience - normally a fence can be slid back out of the way but not here. Then the two cam levers are turned and withdrawn to lift the gull wing tables out of the way. A note of warning: while the tables are still down and the fence removed the machine is still live with the cutterblock exposed. Only when the tables are lifted do the microswitches isolate the motor. 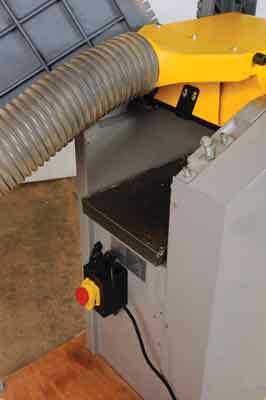 The extraction hood swings over and clips easily in position, extraction is as good as your extractor setup. You may be advised to consider an upgrade if you don't already have chippings extraction. 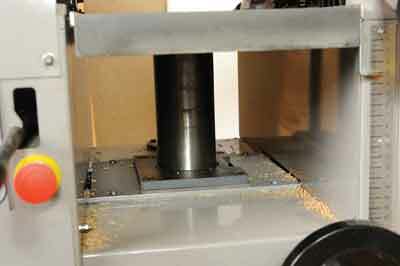 Height capacity through the thicknesser is good at 180mm. The noise level of the machine both free running and under load was commendably quiet by planer standards, no doubt the noise reduction slots helped here. Conveniently it comes with just a 13-amp plug, no hard wiring required! 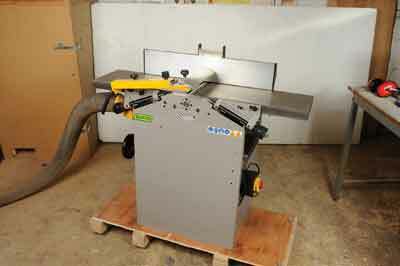 Overall, Warco have a winner here - it is perfect for the smaller workshop operation.